Forklifts are not often noted for their beautiful lines or beguiling curves, but you might be surprised at how many forklifts and forklift accessories win industrial design prizes for these very things. Yet good industrial design is more than just appealing lines and curves. Above all, it is about finding beauty in functionality. Melissa Barnett looks at forklifts from the drawing board to rolling off the production line. The Industrial Design Society of America believes the aim of good industrial design should be "the creation of products and systems that optimise function, value and appearance to the mutual benefit of both user and manufacturer". For anyone designing a forklift, the value and function of the equipment has always been paramount. Increasingly, however, the emphasis has swung to safety, environmental responsibility and operator comfort. Appearance may be last on the list of design priorities, but with increasing collaboration and shared synergies between the materials handling and automobile industries, aesthetics is now well and truly in the mix. The design cycle for a forklift spans seven years and, from initial sketch to manufactured prototype, there can be up to 32 phases of design drawing, tweaking and modeling. That’s before testing and manufacturing begin. Many OEMs stagger their new product designs so that different types of forklift are at different places in the design calendar. 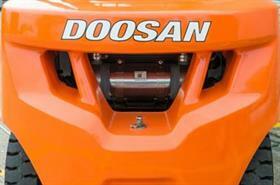 Doosan is able to take advantage of its own extensive industrial platforms. The design process for forklifts is holistic and collaborative, involving industrial engineers, mechanical engineers, industrial designers, experts in ergonomics and work place health and safety professionals, to name a few. Dealers are also involved in providing feedback on production models. Ross Grassick, managing director of Australian forklift dealer Lencrow, says its position as a service provider also involves the testing of new models and alerting manufacturers to patterns of failure or early wear on components. Many forklift and parts manufacturers have in-house R&D and design teams, while others form partnerships with industrial design houses and universities. Doosan, for example, is able to take advantage of its own extensive industrial platforms and recently completed a 26,000 sqm building in Incheon, Korea to house 1,000 research and development personnel across a number of different sectors. Doosan says the centre has been specifically designed to facilitate collaboration between the different business groups within its infrastructure support division. Linde is famous for its 33-year collaboration with Porsche Engineering. The partnership extends across the entire design process, from forklift concept phase to production optimisation. According to Ralf Dingeldein, managing director of the Linde’s Willenbrock Group, Linde’s design mantra is ‘form transports function’. 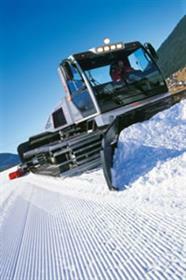 "The design should visualise the technical and ergonomic qualities of the machine. The driver and his workplace are the focus of this process; the driver should have a comfortable feeling of space, optimum visibility, intuitive operating functions and access and exit points," he explains. Forklift and parts manufacturers often partner with local universities for testing and analysis of design issues. Toyota Materials Handling Europe (TMHE) last year signed a long-term strategic partnership with Sweden’s Linköping University’s Department of Management and Engineering. The partnership aims to produce "world-class scientific results focusing on life-cycle analysis and sustainability". CEO Matthias Fischer says that, "Toyota products must be completely recyclable by 2020 and the collaboration will have a particular focus on avoiding waste and reducing hazardous products in Toyota forklifts". He believes that partnering with Linköping will generate new ideas and attract the most talented staff to the project. Toyota also has in-house design teams based in Japan and Sweden. In the 1980s and ‘90s, Toyota partnered with a number of automobile designers including Pinafarina and Bertone, with the idea that forklifts should be as comfortable and safe as cars to operate. The final stage of the design process is manufacturing. 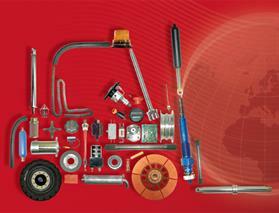 Many of today’s forklift components are produced elsewhere and then assembled at OEM plants. According to Dirk Von Holt, vice-president of sales at TVH USA, the parts business is vital to forklift manufacturers. "In the past, OEMs have used their branded parts to subsidise the sale of new forklifts; however, over the years, most forklift manufacturers have developed into assemblers (and) most parts, components and sub-assemblies are purchased, leaving only items like controllers, operator features and specific software as branded components. There are very few manufacturers who maintain a high vertical depth." With over 2,400 parts in a Class 1 electric forklift and 3,200 in a Class 4 IC forklift, it is clear that the forklift parts business has an enormous scale. Grassick says that forklifts today are a product of many countries. "Most manufacturers have a range or a part of the product made in China and Chinese forklift manufacturers source components and technology from around the world," he explains. Grassick also believes that parts quality has improved in recent years and owners now have better access to parts as well as extended warranty periods. He has seen an increase in the use of generic parts that meet the needs of a wider market. Increased global supply and demand, he suggests, has prompted suppliers to improve delivery and set up new manufacturing plants in countries closer to the end-user. Von Holt says the prohibitive cost of OEM genuine parts had consumers looking more often to alternative brands. 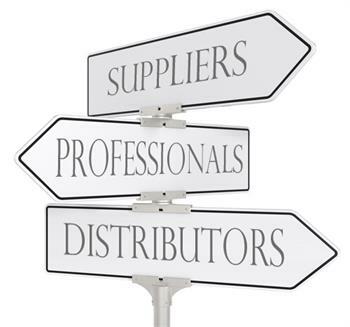 "The generic parts distributors have been doing an outstanding job to lose the stigma of ill-fitting, low-quality parts from parts providers. After all, most parts sold as aftermarket alternatives come from the same manufacturers as the genuine parts," he says. Grassick adds that these days he sees far fewer grey imports being supplied and sold in the market. Industrial design engineers do not generally sit on their laurels: if there is a way to improve something, they will try to do it and the components industry is no exception. The Engine: Forklift components can be industrial design award winners, too, with Doosan’s G2 diesel forklift engine winning a Forklift Truck Association (FLTA) Innovation Award in 2014. The G2 uses a new combustion system to comply with the latest Tier IV standards, while completely removing the need for a diesel particulate filter (DPF). The resulting clean-burn engine is fitted to Doosan’s 2.0 t – 3.5 t forklift models. Tim Waples, director of Doosan Industrial Vehicle – UK, believes the G2 is a "shining example of the applied research and development capability within the Doosan group". "Instead of trying to modify an existing engine to comply with new regulations, our designers made a completely new engine that reduces emissions so much that a particulate filter is no longer needed," he says. The G2 also improves fuel efficiency by 33%, reduces vibration by 33% and cuts noise levels by 10%. Tyres: Taiwanese tyre manufacturer Apexway believes its 20.5–25 in. (51-63 cm) non-marking white tyre might be the largest non-marking tyre currently available in the world. Spokesman David Chang says the 25 in. OTR (off-the-road) non-marking tyre was launched in late 2014 and is suitable for glass manufacturers and food distribution centres. Chang says that adoption of environmentally sustainable practices drive their tyre design. " We currently use liquefied gas in production, our curing stack takes a larger number of tyres for curing, thereby reducing energy costs, and we have reduced the distance our green tyres are moved," he explains. 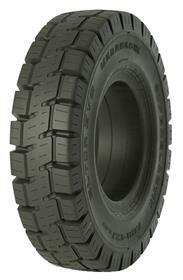 Italian tyre manufacturer Marangoni has a close working relationship with forklift manufacturers. Its latest tyre design, the Eltor EVO, has been developed to minimise rolling resistance and reduce deflection in the tyre, which improves safety and comfort. Lorenzo Stringari, head of Marangoni’s business unit, says that the design changes are a result of collaboration with Marangoni’s OEM clients and its own vision for the future of the industry. He adds that designing tyres for other applications such as trucks and OTR and in demanding environments such as mines and cement factories has been an advantage. "We work with a range of international customers and are able to monitor the tyre performance in these harsh conditions; the findings help us develop better designed tyres," he says. Forklift Controls: David Taylor, marketing director for Curtiss-Wright, says attachment control design has changed significantly in new forklifts. 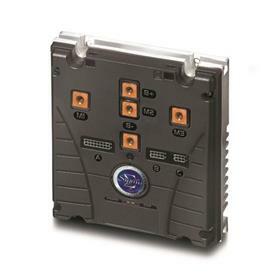 "The industry has moved away from discrete hydraulic controls to fully electronic controls. Electronic controls offer huge improvements in vehicle reliability and maximum operational comfort for the operator." He adds that many controls are now designed to incorporate multiple functions with the use of just one hand, incorporating push-button switches, rotary thumbwheels and joystick paddles and levers, which variously offer switched and proportional control of the vehicle’s lifting features. Traction Controls: While a forklift’s attachments can be controlled by lever or finger/hand-operated joystick controls, the traction and motion of the equipment requires a completely different type of control. Taylor says that Curtiss-Wright’s Sigmadrive controls for AC induction and DC motors have been developed for use in a wide range of electric vehicle applications and involve the most recent control technology, including information management system technology, high-resolution current measurement, CANbus communication and extremely low heat dissipation. CEO Luigi Pomati says that experience and a strong in-house engineering team allows Italian electromechanical company CIMA 1915 to specialise in custom-built steering systems, electro-mechanical brake systems, encoders and gear boxes as well as AC and DC motors and motorised wheels for materials handling traction systems. "We use high-quality materials made in Italy or Germany, while our magnets are sourced from China. What sets us apart is our ability to build and design in-house – for example, the winding of components in the stator and rotor motors are still made by specialised workers at CIMA 1915. This allows us to use bigger sections of copper, guaranteeing higher quality, lower battery consumption and better efficiency," he explains. CIMA 1915 engineers have also designed a unique motorised stainless steel wheel, developed for the highly competitive Italian food and beverage industry. 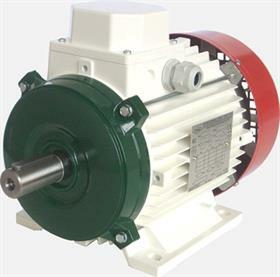 These are used in conjunction with cast stainless steel gearboxes and stainless steel motors. Cabs: Dave Stansbury, managing director of Canadian cab manufacturer Harris-Stolper, says that building a custom cab is like "designing a glove to fit a hand – all hands are different but the glove must fit perfectly". Stansbury says that each application has its own challenges and requirements which are critical to protecting the operator and completing the task. Harris-Stolper has designed custom cabs for just about every environment imaginable, but the same design processes are followed each time: "Once we have a general understanding of the requirements, we can start the initial design phase. Usually, the customer will send us the machine so we can assess the overall characteristics. We then take detailed measurements of the cab mounting area so we can create a 3D model of the area required. "With a 3D model complete, we can then begin the actual design process. During this phase, we consider all the critical input from the customer, while also paying a considerable amount of attention to ergonomics, such as placement of wiper systems, heaters, the ease of entry and exit of the vehicle, and providing as much visibility as possible. "Upon completion of the design phase, we proceed to manufacture of the prototype. Once the prototype is complete, we usually prefer to mount the cab to the truck so we can assess the final installation. We make sure there is a proper cab to truck fit/seal and we analyse the entire cab ensuring all details have been addressed. We also identify any modifications or alterations that need to be made prior to completing the final product. Depending on the type of cab and the application, we will then have the cab tested to make sure it meets safety standards. The cab is then sent to the plant for final assembly and installation." Windows and windscreens: Windows are a vital but often taken-for-granted part in a forklift build. Italian glass manufacturer Hard Glass has been manufacturing electrically heated glass for two decades. Spokesman Michela Borile says that a recent request from cold store cabs manufacturers for polycarbonate glass has led the company to develop a new electrically insulated fully polycarbonate product, Calorit P. Calorit P’s design has an almost invisible electrically heated wire net layered within the polycarbonate sheet. 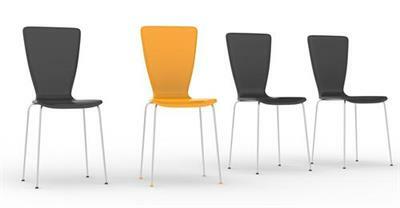 The new design allows cab manufacturers to install heated Calorit P as an alternative to monolithic or laminated glass. Polylaminate is virtually unbreakable, weighs less than half of glass equivalents and is scratch-, chemical- and UV-resistant. "Hard Glass is always available to work closely with engineers and designers in order to satisfy new product developments and the demands of growing markets," Borile adds. Mirrors: How often does a mirror win an industrial design award? BOLO Mirrors, an Australian forklift mirror manufacturer, has done just that, winning the Australian Good Design Award in 2014 in the Commercial and Industrial Category. A newcomer to the market, BOLO initially pitched its product to BMW and was granted a small business partnership with the automobile manufacturer. When the GFC hit, the project was mothballed; hence the foray into the materials handling sector. After almost five years of design development and testing, Tim and Craig MacDougall recently launched a slim-line 10 cm version of the original BOLO mirror concept. The mirror has been designed in collaboration with Sydney-based industrial design company Ideal Industrial. The design has been tested in real time with real users who, says Tim MacDougall, "get it" as soon as they sit in the forklift. The BOLO (Be on the Look Out) mirror is a forward view mirror system, allowing forklift drivers to sight the tines and see around the load in front of them, significantly improving safety and reducing damage to goods and infrastructure. From engines to mirrors and everything in between, the common link is human-centric, thoughtful industrial design. 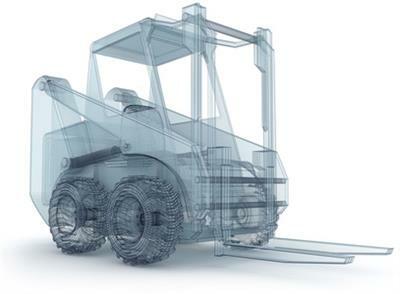 The large forklift manufacturers may be leading the way with definitions of good forklift design, but at every level we can see there is an aim for product design to be safer, better and more efficient.